MAA Market Practice and Business Plan Guidelines (Guidelines). The Guidelines apply to direct distribution by Insurers and distribution through Agents of Insurers and to verbal, written and electronic services for the issuing of CTP policies in respect of all vehicles registered or required to be registered in NSW. The Guidelines do not apply to the issuing of policies for vehicles with Conditional Registration or Unregistered Vehicle Permits. Policies for such vehicles are subject to a contract awarded by tender to a single Insurer, and so are not subject to competitive market practices for the issuing of policies. Insurers must consider each part of the legislative framework when determining CTP business processes, practices and strategy. It is a condition of a licence granted under Part 7.1 of the Act that the Insurer must comply with the guidelines in force pursuant to sections 171 and 173 of the Act. This Practice Note relates to the Guidelines issued on 1 November 2014. It is supplementary to the Guidelines themselves. It provides information and guidance for Insurers as to how the Guidelines are to be applied. As any documents, attachments, and correspondence relating to previous Guidelines are superseded by this new version of the Guidelines, Insurers cannot rely on those documents, attachments and correspondence after 1 November 2014. Any Insurer with an existing relief from regulatory and enforcement action (for a temporary and unavoidable need) will have to reapply for relief if required. The objects of the Act include keeping premiums affordable, recognising that CTP insurance is compulsory for all owners of motor vehicles registered in NSW. The MAA's regulation of premium setting limits risk rating and thereby ensures a measure of affordability for every vehicle owner. To ensure the effectiveness of these regulated premium arrangements, which necessitate an element of community rating, the Guidelines include a requirement that all Insurers be prepared to quote on and accept the CTP insurance of any vehicle owner. The MAA refers to this system as an equal access regime. As it is in each Insurer's commercial interests to select over-priced risks over under-priced risks, the purpose of the Guidelines is to explain and enforce a set of market practices that protect the integrity of this equal access regime. The Guidelines are intended to protect the opportunity of every vehicle owner to obtain a CTP Policy from any licensed Insurer, irrespective of the Insurer's wish or preference to accept or reject the policy or charge a premium that is different from the regulated price. Insurers' lack of clarity of the MAA's expectations of market practices. Insurers have applied their own interpretations of the pre-existing Guidelines that have led to some inconsistent and some inappropriate practices by Insurers. The Guidelines do not reflect modern commercial practices such as the use of the internet and have tended to discourage flexibility and innovation in the delivery of services to Customers. Instead of the MAA setting rules, CTP Insurers are able to make their own arrangements as long as they comply with the Guidelines. The MAA is expecting Insurers to demonstrate how they meet the Guidelines so that Insurers can compete in the CTP market as they see fit subject to complying with the Guidelines. The Guidelines are principles-based. They articulate a set of principles for the issuing and maintenance of CTP policies and a set of expectations for the market practices of Insurers. The Guidelines are designed to establish a level playing field by ensuring that all Insurers understand the MAA's expectations of market practices. The MAA recognises that Insurers apply private capital in a competitive market place in a commercial way, working within legislation, and that there is a need for certainty by Insurers. Market practices are balanced by a mutual understanding among all parties that CTP insurance exists for the benefit of the community. The adoption by the MAA of principles-based regulation of market practices is intended to encourage flexibility and innovation in the delivery of services to CTP Customers whilst ensuring full and fair coverage of the CTP market. Insurers are required to conduct their CTP business in accordance with the principles contained in the Guidelines. The MAA expects Insurers to monitor their compliance with the Guidelines through their annual risk management and compliance program or audit program. In addition, the MAA may conduct audits and compliance monitoring activity on any aspect of the Guidelines. This may be on a scheduled basis or an ad hoc basis, and may be conducted with Insurers or their Agents. The MAA has developed a Regulatory and Enforcement Policy for dealing with minor and major incidences of non- compliance by Insurers. The intent of this policy is to provide a fair and consistent regulatory response to legislative and statutory non-compliance by Insurers. Act in good faith with all Customers. Use processes and business practices that do not unfairly discriminate against individual Customers or groups of Customers. Engage in processes and business practices that are transparent and practical for the purpose of issuing policies to Customers. Make CTP policies readily accessible and available to all Customers. Evidence of a CTP Policy covering the period of registration is a mandatory requirement for the registration of a vehicle in NSW, and so it is essential that it remains affordable. This is the reason that cross-subsidies are built into the premium regulations. The MAA respects the intent of Insurers to build a portfolio so that there is a balance of over-priced risks and under- priced risks. A prolonged imbalance of risks in a portfolio can lead to either an excessive profit or an unsustainable loss. Neither outcome is acceptable. Insurers need to be able to demonstrate a genuine ability and intention to do business with every Customer. In practice this means that when asked for a quote, an Insurer or its Agent must promptly and willingly provide one, and if the Customer asks to buy, the Insurer or its Agent must promptly and willingly issue the policy. It is unacceptable for Insurers to use distribution methods and sales techniques that purposefully inhibit access to CTP insurance for any Customer irrespective of the risk profile of the Customer, the Owner or the vehicle. For example, it is unacceptable to have a website that limits the issuance of CTP policies to certain types of vehicles, vehicle Owners, vehicle Owner age or region. It is also unacceptable to de-prioritise telephone calls in a queue from any particular region of the state. Insurers and their Agents must not use processes and business practices to discourage individual Customers from purchasing CTP policies from them. This includes active discouragement by means such as advising a Customer of prices offered by another Insurer. Insurers must not passively discourage certain Customers by, eg providing low service standards to certain Customers or requiring high risk Customers to visit a shopfront which is not convenient to them. Where there is no other line of business to assist in setting the service standards, the Insurer must maintain service standards that match or exceed relevant industry standards or industry practices. If for some reason an Insurer's agreed service standards cannot be met on a temporary basis, the Insurer must inform the MAA and seek relief from regulatory and enforcement action. For example, if an Insurer system has malfunctioned and renewals have not been sent to some Customers within the minimum time for renewals, the Insurer may seek temporary relief from the MAA for such a breach. Refer to Section 6 of the Guidelines. The maximum rate of commission on a per policy basis is capped at 5 per cent. Filings are to occur as per relevant legislation and regulation and the Premiums Determination Guidelines. Insurers may provide further details on their commission structure in their annual business plan. However an Insurer and its Agents may refer a Customer to the Green Slip Calculator on the MAA website if the Customer is seeking alternative quotations. The intent of this principle is to promote efficient, open, fair and honest information exchange between Insurers or their Agents and their existing and potential Customers. Information should be readily understood by the use of plain language. This applies to all information including verbal and written formats in English and, where translated into other languages spoken in NSW, consistent with each Insurer's other lines of business. Premiums are to be charged as filed for all Customers, including the employees of Insurers and their Agents. The MAA regards that any CTP benefits offered by the Insurer to staff and their vehicles will be fully accounted for by the Insurer; eg the Medical Care and Injury Services levy is to be paid at the full filed premium applicable to that CTP Policy, with the Insurer accounting for the difference between the filed price and the amount paid by the staff member, ensuring that the CTP premium pool is not depleted of funds. Insurers are to collect relevant data from Customers and other sources to be satisfied that the correct premium is being charged. The data should be up to date as advised by the Customer or verified by RMS data. Insurers are to provide Customers with an appropriate level of responsiveness that allows for an efficient information exchange between the Customer and the Insurer. This extends to the provision of information and assistance in purchasing CTP policies. Offers of renewal must detail all factors applied by the Insurer to determine the premium payable. This includes the vehicle and Customer risk rating factors, the Input Tax Credit status and other factors. Insurers should remind Customers to check that the factors are correct prior to the purchase of the policy and to contact the Insurer if changes are required. The principle of transparency extends to relationships between Insurers and third parties, including aggregator websites. Insurers may choose to enter into commercial arrangements with third parties for promotion or sales purposes. However Insurers should ensure that any third party informs Customers of all relevant commercial arrangements such as which Insurers the third party has contracts or arrangements with. This information should be provided to Customers prior to quoting or sales taking place. Insurers should determine whether an insurance comparison or aggregator website that utilises the MAA's Green Slip Calculator or related facility is authorised to do so. If not, the Insurer or its Agents should not enter into a commercial arrangement with that insurance comparison or aggregator website unless the insurance comparison or aggregator website can demonstrate that it has the MAA’s permission to access or retransmit Green Slip Calculator results or data. Insurers may choose to offer different methods of delivery of policy information to Customers. The default method is to use postal services, with other methods requiring the Customer to consent or 'opt in'. If an Insurer becomes aware that delivery of policy information to a Customer has not occurred (eg mail returned to sender, or notification of non-delivery of email) the Insurers may use available resources to reissue. The onus is on Customers to keep their notification addresses up to date with their Insurers. Insurers must not discriminate between risk profiles in reissuing policy information. In order to streamline the Customer experience with the registration process, Insurers are to provide Roads and Maritime Services with electronic notification of the existence of a CTP Policy as soon as is practicable after payment has been received for the CTP Policy (an ‘eGreenSlip’). Insurers are to inform Customers of the usual variation in timeframes for this notification to occur as a result of using different payment channels. All CTP quotes and policies must display the name of the Insurer of the CTP Policy, and if different, both the trading name and the name of the Insurer. The trading names and names of all Insurers are recorded in Schedule 1 attached to the Guidelines. An Agent may put their own label on the CTP quote or policy, provided both the trading name and the Insurer are displayed. However it is not necessary to display the name of an Insurer's Agent who has provided the quote or sold the CTP Policy. The MAA has a number of minimum requirements for offers of renewal. These are specified in the Guidelines, with other requirements under development through the Green Slip Redesign Project, which will be contained in the Business Rules. ensuring that any requests by a Customer of an Insurer to accept a quote or a renewal offer results in the Insurer making a policy available to the Customer. The intent of this principle is to enable all Customers to choose between CTP Policies in a genuinely competitive market, regardless of vehicle class, locality or risk profile. It aims to make price and service the primary factors taken into account by Customers when choosing CTP insurance, without limitations being created by distribution practices. Provided that the principles of these Guidelines are met, quoting and sales may occur via direct channels and indirect channels including Agents and brokers or through a separate entity such as an aggregator website. Where a contractual arrangement is in place with an Agent, the Insurer must ensure the terms and conditions of the contract comply with the principles in the Guidelines. Insurers will need to ensure that services relating to the issue of CTP Policies for new policies or for queries regarding existing policies are readily available. Insurers may choose their own operating hours, eg by referencing their other lines of business, however the MAA expects that the Insurer will take into consideration the maximum operating span of hours of Service NSW Service Centres that offer registration services as a minimum service standard. Every Distribution Channel used by an Insurer is generally expected to offer a full range of services for Customers either renewing their policy or taking out a new policy. Customers must have the ability to source a quote from an Insurer, regardless of whether the Customer wishes to identify themselves or the vehicle that is subject to the required CTP Policy. There are limited circumstances only where it is acceptable for an Insurer to refuse to sell a CTP Policy. These circumstances are specified in Schedule 2 of the Guidelines. Insurers must make every effort to assist the Customers in providing information so that the Insurer can ascertain the correct premium. Where a Customer is having difficulty in providing information, Insurers must make a genuine effort to assist the Customer. For example, Customers using the internet may be assisted by a web chat service, or a call centre operator could wait on line while the Customer finds the RMS Registration papers. An Insurer could place a link to RMS's online facility for transferring registration on their website. An Agent may make a telephone available for the Customer to contact RMS to obtain the necessary identifiers. Insurers could use their systems and processes to inform Customers of identification requirements. Insurers could also promote on their website the factors they use in setting their prices and where the Customer can find this information. For the payment of premiums, Insurers may provide a call centre, an automated payment service, flexible payment options or full end to end website, so at least one option to make payments on a real time basis is available to Customers 24 hours a day seven days a week. Each year, Insurers are to provide to the MAA a business plan relating to CTP business, comprising a complete description of their CTP related distribution arrangements and associated business plans. The purpose of providing business plans of this kind is to satisfy the MAA that the Insurer’s business plans fully comply with the principles within the Guidelines. The Insurer must keep its business plans up to date and provide the latest version to the MAA whenever material changes are made. The MAA's goal is to enable Insurers to take initiatives and operate their CTP business without compromising the principles within the Guidelines. If Insurers are in doubt as to whether an action might breach a principle, they should seek guidance from the MAA. A structured and unstructured approach to the interaction of Insurers and the MAA should assist this goal. A communication framework will support an interchange of information about market practices between Insurers and the MAA. The communications framework will oblige Insurers to explain to the MAA how they intend to conduct their CTP business and to seek guidance to ensure compliance with the principles within the Guidelines. The complete description of the conduct of the CTP business including the structure and operating arrangements for each Distribution Channel and any plans for change. The steps taken to ensure CTP Policies are readily accessible and available for all Customers. For example, an Insurer might map all regions and vehicle classes against its distribution network to ensure full coverage, or an Insurer may detail the operating arrangements including hours of call centres or availability of Internet services. A description of the types of Distribution Channels including branches, telephone, internet and Agents including motor dealers and their contractual arrangements. Insurers are to describe the classes of business (including new business and renewals and CTP classifications) written through each channel, and the percentage of premium written through each channel. For example, for an internet channel, an Insurer should show the vehicle classes and regions that are accessible, confirm how quotes, new business and renewals are transacted and any other functionality available. The Insurer could demonstrate use of online services by indicating, eg past business volumes and values written through the internet by month of transactions. If operating terms and conditions vary across channels, the variations should be explained. An explanation of each Agent channel including the contractual arrangements will assist the MAA to understand how the Insurer complies with the principle of ensuring processes and business practices are transparent and practical for the issuance and administration of CTP Policies. For example, an Insurer using motor dealers as Agents should explain the business process for motor dealers, the contractual arrangements with them, including all commissions and other payments and a description of the business written through the motor dealer network. A description of the process and business practices in place to ensure they do not unfairly discriminate against individual Customers or groups of Customers. For example, the Insurer could describe the scripting and training in place with call centre staff and Agents that controls practices to prevent any discrimination based on the risk profile of the vehicle and vehicle Owner. Any additional arrangements for engaging with Customers should be described, eg services provided to Customers with disabilities, or to non-English speaking Customers. A description of the service standards expected for CTP transactions, why the Insurer believes these standards are appropriate and their relevant targets, and the actual performance against these targets. Section 5.2 of this Practice Note illustrates some of the standards that should apply to CTP policies. Insurers may use standards that are consistent with the Insurer’s other product lines or, where such standards do not exist or are assessed as inappropriate, industry standards. Insurers should explain any gap between the actual performance measured against their targets and the steps being taken to improve performance. A description of any planned improvement, innovation or change to the distribution methods and sales techniques within the next 12 months, and how any change will comply with the principles within the Guidelines. It is expected that Insurers will regularly discuss with the MAA their compliance with the Guidelines including how they are performing against their business plans. The amount of regular consultation is dependent on how the Guidelines are being implemented. Furthermore, a continuing dialogue will be required whenever the MAA is seeking further details to better understand an Insurer’s business plan, or is not satisfied that the principles of the Guidelines are being met. Insurers are encouraged to communicate with the MAA whenever they consider it appropriate to do so. This may be when an Insurer is contemplating a change to a practice and when implementing a change to a practice. Insurers may seek guidance as to whether such changes contravene one or more of the principles in the Guidelines. Insurers must notify the MAA as they become aware of any breach of a principle that has a material impact on Customers. A breach may include an action contrary to the principles or a breach of the Guidelines by itself or by any other Insurer or its Agents, complaints from Customers of a critical, systemic or unusual nature, or the detection of fraudulent activity. For example, if an Insurer becomes aware that an Agent has defaulted on its account, or where an Insurer has a system malfunction and is unable to issue renewals in the timeframe specified, the Insurer is to advise the MAA immediately. The purpose of such notification is to ensure the interests of the public are at the forefront so the MAA and Insurers can respond as quickly as possible and take all appropriate action. Insurers are to supply the MAA with reports on any aspect of the Guidelines as requested from time to time. For example, Insurers are to supply their complaints register and analysis of complaints, as described in Section 7 of the Guidelines, to the MAA on a six-monthly basis. The MAA recognises that Insurers may update their supporting documents and Customer communication materials from time to time. Such documents must be provided to the MAA promptly when requested. They may include plans, manuals, templates, Customer information sheets, and screen shots, as well as frontline staff materials such as scripts, training manuals, copies of CTP certificates, and Customer information packs and other support materials. The MAA may require these items to better understand how the Insurer conducts its CTP business or the basis of any complaint by Customers. The MAA defines a complaint as an expression of dissatisfaction made to a CTP Insurer where a response or resolution is implied. The MAA understands complaints can provide insight into Customer perceptions of market practices and can be an indicator of the effectiveness of the CTP system. An Insurer’s complaint process should facilitate communication with both parties and the resolution of a complaint. Information for Customers about how to make a complaint in relation to the issuance and administration of CTP policies needs to be readily available and accessible to the Customer. As a minimum it should be included on the Insurer’s website. The Insurer needs to explain to the Customer the complaint process, the time it should take for resolution and how communication between the Insurer and the complainant will occur. The Customer should also be advised of the process if they are not satisfied with the Insurer’s proposed resolution and they wish to take further action. There must be explicit reference to the rights of the Customer to escalate a complaint to the MAA, and an explanation as to how the Customer should contact the MAA. Insurers are required to provide the MAA with a register of all complaints on a six-monthly basis together with an analysis of Level 2 complaints. The purpose of the analysis is to provide feedback to the MAA as to potential issues with an individual Insurer or with the CTP system as a whole. The adoption of principles-based market practices by Insurers is intended to encourage flexibility and innovation in the efficient delivery of services to CTP Customers, while ensuring full and fair coverage of the CTP market. Insurer market practices and distribution arrangements must align with the Guidelines. Insurers are encouraged to act competitively without contravening the Guidelines. 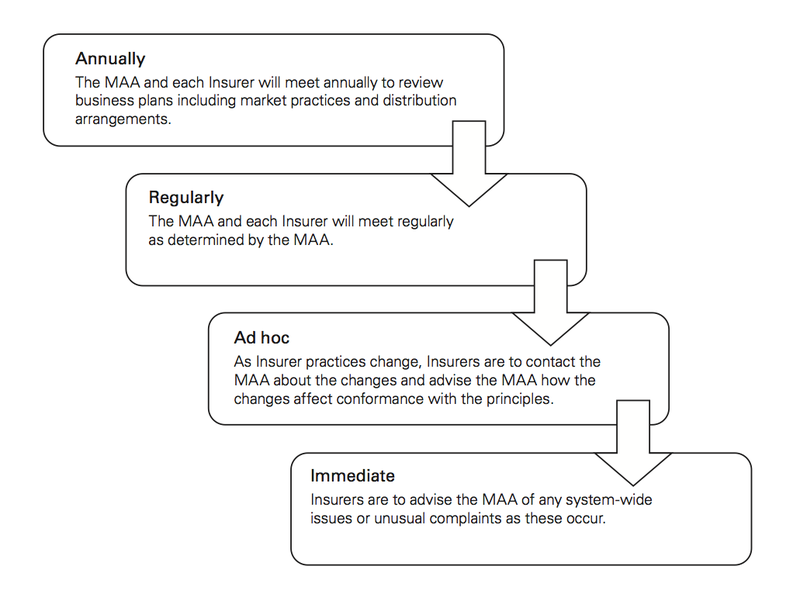 Where an Insurer is contemplating a variation to its market practices that may fall outside the principles contained in the Guidelines, they should seek guidance from the MAA. Where an Insurer believes it has a temporary and unavoidable need to operate outside of these Guidelines, it may apply for relief from regulatory and enforcement action. The Insurer would need to write to the MAA and state the circumstances, the reasons why relief is necessary, the nature and extent of non-compliance with the Guidelines, its duration, and any other supporting documentation as appropriate (eg the number of Customers affected by the circumstances). The MAA will then determine its position. The MAA will consider if granting relief from regulatory and enforcement action is in the public interest and whether the circumstances impact negatively on the efficient operation of the Act. Such relief will be granted only in extenuating circumstances and where the MAA considers it to be reasonable. The MAA will take into consideration whether the relief would give an unfair market advantage to the applying Insurer, or to any other Insurers. For example, if an Insurer is experiencing unforeseen system issues and is unable to issue CTP Policy renewals within the timeframe specified in Section 5.4, then the MAA may consider a temporary relief from an enforcement response for that Insurer. and marked to the attention of the General Manager.